The old saying goes, “With friends like this, who needs enemies?” If anyone could have uttered those words, it is Jesus Christ. Today’s passage in John 18 takes us quickly through the trial of Jesus before Annas, along with the three denials of Peter. So Jesus is arrested and taken first to Annas – the former high priest. He was followed in office by five of his sons and ultimately his son-in-law Caiaphas – who was at this very moment the officially serving High Priest. So this first trial is before Annas – who is at this point a sort of “high priest emeritus.” We will see that out of the 12 disciples, two are present here, one has betrayed Christ, and the other nine are nowhere to be seen! The unnamed “other disciple” in our author, John … who was somehow sufficiently known in the circles of Jewish leadership to get inside and to have Peter also allowed through the gates and into the courtyard. A servant girl allows this, and ponders with a question if Peter is one of Christ’s disciples – the question asked apparently with the tone of “You’re not one of the whackos who follow this nut-job Galilean preacher dude, are you?” Luke’s gospel adds that she had seen him with Jesus. He replied, “I am not.” And we get the picture that on this chilly evening in Jerusalem in the middle of the night there is a group of standers-by who are warming themselves around a fire. And Peter is there, attempting desperately to blend in. An interesting element we tend to overlook is that Annas is here presented as asking first about Jesus’ disciples – probably not referencing the 12 specifically, but rather the mass of people who accepted his teaching. Nonetheless, this must have been a creepy moment for both John and Peter standing within earshot of this exchange. And of course Annas is interested in hearing about the teaching itself – seeking to evaluate the nature of this man’s message and what substance there may be to any feared insurrection. Jesus affirms he has spoken the truth publically, and refers the question to the masses of the people and what they understood. The trials of Jesus were filled with a great number of illegalities. Here is a wrongful attempt at getting an accused person to self-incriminate. A second time an individual begins to recognize that Peter was previously with Jesus. Peter’s cover was cracking. Surely his Galilean accent was giving him away as well. The third accusation is from a relative of Malchus – the fellow whose ear had been sliced off his head. Surely the perpetrator of such a deed would be recognized and remembered. From the other gospels we know that Peter on this occasion very vehemently denied knowing Christ. The rooster crows as Jesus had predicted, and a synoptic account reveals that Jesus looked through the crowd and made eye contact at this very moment. Wow! Peter – what a loser! Or is he? Surely not any one of us would have done the same thing in the same situation! Or would we? Would we even be there close enough to make a denial? This was a failure on Peter’s part – without doubt. He had earlier proclaimed he would die for Christ (and ultimately he would). But recall this – though ill-conceived and foolish, it was Peter who was willing to swing a sword when a cohort of about 60 soldiers and others came to arrest Jesus. And while the bulk of the disciples were slinking about in the darkness on the other side of the Kidron Valley while Jesus is being put on trial, Peter is risking being nearby. Does close only count in horseshoes and hand grenades? How close are you identified with Jesus? At work? On Facebook? At the Thanksgiving table? At the soccer club? In biology class? At your Rotarian luncheon? In the Board Room? 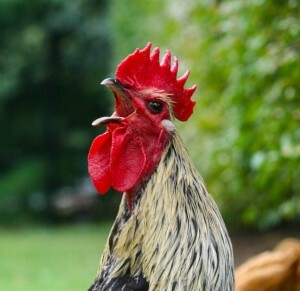 Do you hear the crowing of a rooster? This entry was posted in God Up Close and tagged John 18, Peter Denies Christ, The denials of Peter by Randy Buchman. Bookmark the permalink.